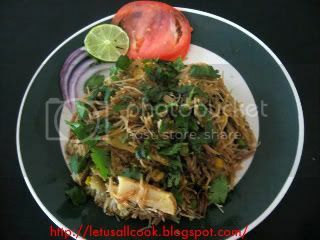 Recently I came across various version of Vermicelli (Semiya) Biriyani in many of our foodie's blog. This variety of Biriyani was really new to me. The only things I have tried with Semiya(Vermicelli) are Vermicelli (Semiya) Payasam and Semiya Upma. The main thing that made me skeptical in trying this biriyani is, lumps. If you screw the process it is for sure you will land up having lumps. But, I have a cure for that now. Its easy and tasty. To avoid getting lumps in any of the semiya recipes, fry them in Ghee/Oil till they become light brown in colour. This really solves the lump issue. The rest depends on your recipe. 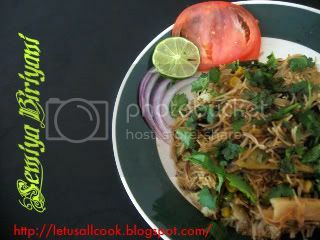 So, here comes my vermicelli Biriyani Recipe. 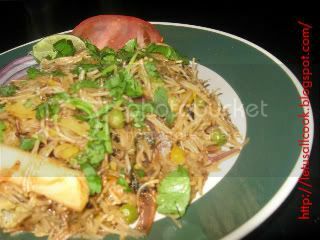 In a pan, fry the vermicelli in ghee. Allow it to cool.Keep it aside. In the same pan, add the ghee. When hot, add cloves,bay leaves,cinnamon stick,cardamom and wait till you get t he aroma. Add the onions and saute them. Add salt. Add mint leaves and cook. Add the blended mixture to it and cook in Sim flame till the raw smell is vanished. Add chilli powder, cumin powder,coriander powder and mix well. If you want colour, you can add either saffron powder or soy sauce to it. Add the vegetables, corn and peas and add little water and cook them. When the vegetables are 75% cooked, add 2 cups of water and wait till it comes to a boil. Now add the vermicelli and cook in a Sim flame. Mix occasionally so that the bottom is not burnt. Garnish it with cilantro and little lime juice and serve hot with your favorite side dish. Need recipes for side dish? Don't worry! You can find them in my recipe index. Interesting recipe, will surely give it a try sometime! In these parts we most use vermicelli for sweet desserts and Hindu and Muslim festivals and holidays. Intresting and unique recipe Sangeeth.Looks Awesome.Will try for sure.